Annual plants die in the fall after they scatter their seeds directly on the ground or include them in fruit that is consumed by animals and deposited elsewhere. Their seeds contain hormones that cause them to germinate in the warm spring weather that follows winter cold. Perennial plants, deciduous woody shrubs and some trees go dormant in the winter and begin growing again in the spring. Evergreen trees and woody shrubs conduct photosynthesis at a reduced rate. Trees store reserves of nutrients during the spring and summer growing season. When the days begin to shorten, the temperature falls and the light spectrum changes from blue to red, hormones tell the plants to bear fruit and begin dropping their leaves in preparation for going dormant during the winter. As the green chlorophyll needed for photosynthesis disappears, the leaves turn orange, red and yellow. 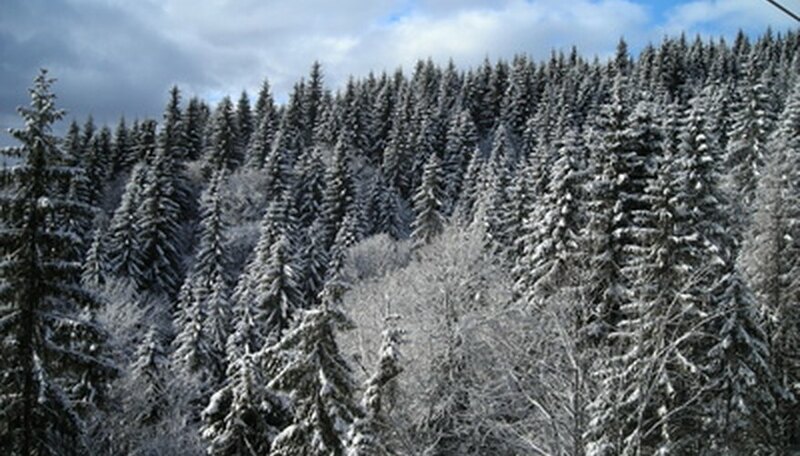 Evergreen trees conduct photosynthesis at a reduced rate during the winter, especially during periods of thaw. Freezing temperatures and frozen water make water a scarce resource for plants in the winter. Sap in tree trunks and branches contain water that is sometimes frozen but is made available by thaws. Snow can insulate the ground keeping it from freezing so that plants can draw water from the soil; conifer needles below the surface of snow can absorb water from the snow. Plants that are dormant, not conducting photosynthesis or losing water from their leaves need less water. Leaves lose water through their pores, called stomata, a process called transpiration; to avoid loss of water in the winter, deciduous trees drop their leaves. The needles of evergreen conifers last two or three years before they are shed. The needles have a thick waxy coating and tighter pores to prevent the loss of water. The dark needles absorb more heat; this helps them survive winter cold but a warm spell causes the needle temperature to rise, resulting in a loss of water through transpiration. Long tubes called tracheids form the xylem or vessels that move water within trees. The cohesive properties of water allow it to be “pulled” through the adjoining tracheids in continuous columns. As ice forms, it expels gases that cause spaces or breaks in the column of water. In an evergreen, the expanding ice seals the ends of each tracheid, forming "floats" that function as valves. Each float is called a torus. The tracheids have strong cell walls that retain the gas expelled when ice forms; as the ice melts, the gas is forced back into the water, opening the tori and restoring the water column. When deciduous trees emerge from dormancy in the spring, they grow new xylem cells to re-establish columns that might have been broken during the winter. Snow can collect on conifer needles causing branches to break, so conifers have fewer branches growing to the side. Their branches point down, not out, allowing them to shed snow more easily. The fibers of their wood are usually longer, making the branches more flexible. Plants in extremely cold climates in high altitudes or northern latitudes are often smaller, enabling them to stay beneath the insulating snow in the winter and avoid cold winds and blowing ice. The needles that conduct some photosynthesis year round help make up for short growing seasons in extreme northern latitudes. Why Do Evergreens Not Change Color in the Fall? Why Do Evergreens Stay Green in the Winter? What Are the Benefits of Rain Water When Growing Plants? Why Do Pine Trees Stay Green in Winter? Why Do Evergreens Have Needles?